Michael Darter's incredible journey to find his brother missing in action 70 years ago. Michael Darter barely knew his older brother Eugene, being an infant when his brother went off to war. Sadly, his brother was lost on the very first B-17 mission he flew with the 8th Air Force in World War II. For decades, Darter – and his family – struggled with the MIA loss until one day in 2000, Darter did a search on the Internet for the B-17 and, unknowingly, took the first step in an amazing journey that would bring closure after 60 years. 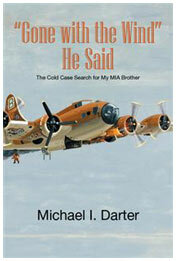 Gone with the Wind, He Said: The Cold Case Search for My MIA Brother is Darter’s masterful account of the quest for answers and a beloved brother. Darter’s book has many things going for it. First off, it’s a touching story about the loss of and search for a lost family member. It’s a useful tool, demonstrating the varied resources available for other families looking for MIA sons and fathers. And it’s a meticulously-detailed, exciting and very well-illustrated account of the 16 December 1943 Mighty Eighth mission to Bremen. There are books and then there are labors of love like Gone with the Wind, He Said. Part detective story, part war story, it’s a compelling, well-written tribute to a brave, young man who went to war and never returned… until now. Highly recommended.